What would a tactical blog be without product placement? Mostly it would look like this one. But I have stumbled across a two things I thought were very cool. I don’t sell these, so you’re on your own if you want to buy them. The Second Amendment was never about just hunting! Practice what you preach. you can stick ‘em to your gear and remove them later. I couldn’t resist. I’m a firm believer the 2nd Amendment guarantees our freedoms and puts teeth in the Constitution. Of course words are only good when backed up by action. I shoot at a cold range. I prefer that for several reasons**, the least of which is the disparity of skills our members have. We have started running a designated rifle/carbine night once a month. To ensure it remains a cold range we have adopted a requirement that all long guns not under positive control (your hand must be physically on the gun) must have a chamber flag or ECI. You’ve seen the ones from the NRA, (http://www.sinclairintl.com/shooting-accessories/high-power-equipment/safety-flags/chamber-safety-flags-prod32534.aspx) and they work fine. Of course you can make one from a zip tie or piece of weed wacker whip. Warrior Tech has what they call Safe Cycle. It fits in your AR chamber no matter .223 rem or 5.56 mm and engages the bold extractor. The Safe Cycle is placed in your chamber and the bolt is slowly lowered on to it. Once Safe Cycle is in place you can insert a loaded magazine. The rifle is still disabled and its condition can be visually confirmed. I could now slap my 28 rd AR mag in place and be a second from being loaded. Getting up and running can be as simple as cycling the bolt with the charging handle which ejects the Safety Cycle and loads the rifle. A second way simply involves grabbing the red arm on the Safe cycle and pulling straight back. That also cycles the gun and puts a live round in the chamber. The way my AR is set up I have to cycle with the charging handle. Good morning class. Today's word is 'pinch point'. Can anyone give me an example? The locking knob on my dot gets in the way if I just grab the red arm and pull back. The system works as advertised, but I found that for matches and activities where you’re on the line every 20 minutes the NRA’s ECI works better. They are bigger, easier to find if you drop it and cheaper to replace if/when you lose it. After about an hour of Safe Cycle in and Safe Cycle out, I dropped it in the black hole I call a gun bag and got out my yellow ECI. Where would it work? In retrospect I’m not sure. If you carried an AR in condition 3 (loaded magazine in place but empty chamber), and were required to have a chamber flag in place to demonstrate your compliance, Safe Cycle could be your answer. Pull the charging handle like you were loading from a closed bolt and you my friend, are up and running. You don't see any stupid fish next to that shark, do you?!? 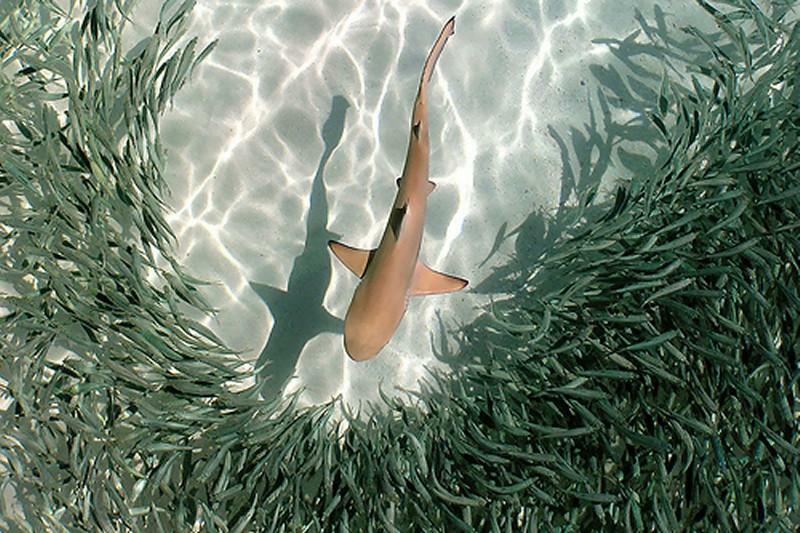 scattered like tropical fish around a shark! The student finally realized what was happening and left the gun in his holster. Talk about pucker factor! !